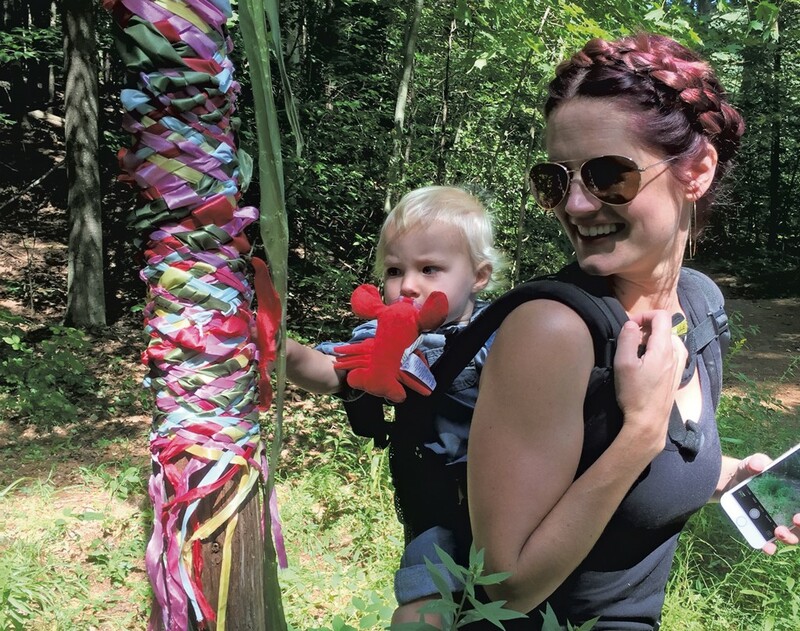 Tot-Friendly Trails | Fit Families | Kids VT - small people, big ideas! 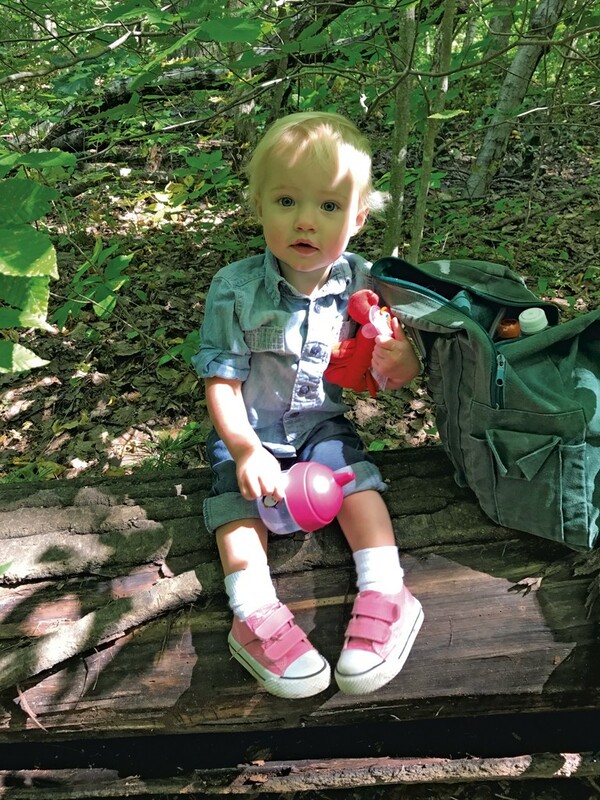 I love hiking with my 1-year-old daughter, Virginia, but I'm in no shape to carry her up steep inclines. 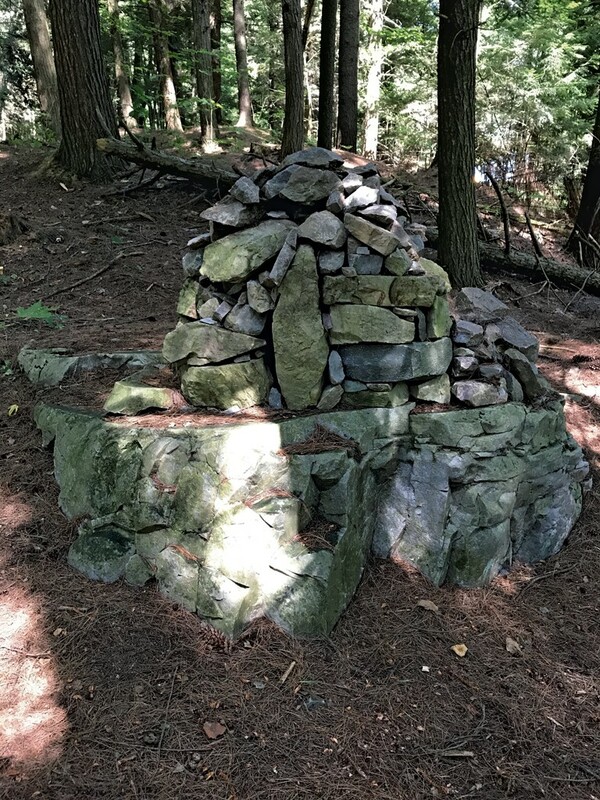 So on a sunny day in early September, we set out with my friend, Rachel, to tackle a trail suitable for both toddlers and adults: the Watershed Center trails near the Bristol/New Haven border. The Watershed Center is a citizen-supported nonprofit promoting conservation and stewardship on five parcels of property in Addison County, covering just over 1,000 acres. As the organization's president Geoff Davis told me over the phone, the center's nine-person volunteer board of directors maintains the trail system, which is accessible via Plank Road. That's where we parked (carpooling is encouraged), slathered on sunscreen, grabbed our water bottles and got a move on. A short distance up the path we found a trailhead kiosk with a map and a "Wanted" poster for sinister-looking yet harmless Eastern Ratsnakes. An adjacent flier explained that the Watershed Center is working with local biologists to track this rare reptile, and asked hikers to report any encounters. I snapped a photo of the map, which came in handy since there are no signs marking the different trails along the way. Folks can also contact the Watershed Center through its website for a paper copy. With Virginia in my backpack carrier, Rachel and I figured we could hoof it up the Main Trail and back down the Ridge Trail for a total of around four miles. As we left the kiosk, a group of passing hikers pointed out a bright green ophidian camouflaged at the path's edge. The sighting was no surprise: Due to what Davis describes as its "wrinkly" terrain, a result of ancient seabed floor being "thrust up" over time, the land is rich with a diversity of species, from mushrooms to newts. We hit a few minor roadblocks — including a fallen tree that served as a perfect bench for a snack break — but the terrain was manageable for little legs. Photo-worthy pit stops included the smooth-as-glass Norton Brook Reservoir and a large dome-shaped stone assemblage that I nicknamed a "mega cairn." Another eye-catching item was a maypole braided with colored ribbon that Davis explained was left over from the Watershed Center's Beltane celebration. The springtime soirée, along with a winter solstice party, happen annually and are open to the public. On the day of our outing, we reveled in the summer-like weather. Still, I envisioned how beautiful our surroundings would be come autumn and winter. The trails are open year-round and, according to Davis, can accommodate everything from walking and wildlife viewing to snowshoeing and cross-country skiing (no mountain bikes or motorized vehicles, though). What words of advice did Davis have for experiencing the Watershed Center trails? "Listen to the sounds of the forest," he told me. "Get on your hands and knees and dig in the dirt." Based on the muddy shoes, dirty knees and big smile that Virginia brought home that afternoon, I'm guessing my pint-size hiker would agree. The Watershed Trails (4783 Plank Rd., Bristol) are free and open to the public, seven days a week. For more information, visit thewatershedcentervt.org. Otter View Park, Weybridge St., Middlebury. This 15-acre park offers universally accessible pathways, including a cattail-lined boardwalk leading to the Otter Creek. Volunteers Green, Bridge St., Richmond. Close-up views of the Winooski River reward amblers of all ages who traverse the short, flat dirt path on the park's perimeter. North Branch Nature Center, 713 Elm St., Montpelier. Those looking to experience the outdoors make strides around a loop of less than one mile with links to Hubbard Park and North Branch River Park. Babcock Nature Preserve, Baker Rd., Eden. One thousand acres, a bog and three ponds, oh my! Owned and cared for by Johnson State College, this open-to-the-public forest also serves as an outdoor classroom.